iMovie ’09 is a kind of litmus test for Mac users. There are those who admire its simplicity and the fact that it requires virtually no knowledge of video editing to operate. Others loathe it largely because it behaves so little like a traditional video editing application. iMovie on the Mac will likely continue to be controversial, but if you have your expectations regarding iMovie for the iPhone screwed on just so, you’ll find very little to argue with. And how might those expectations fit comfortably? By accepting that, in most cases, iMovie for the iPhone isn’t going to replace the full-blown video editing application on your Mac. While you can produce and deliver polished movies with the mobile version of iMovie, it’s very much an on-the-go editor that’s necessarily limited to help you work faster on a small-screen device. 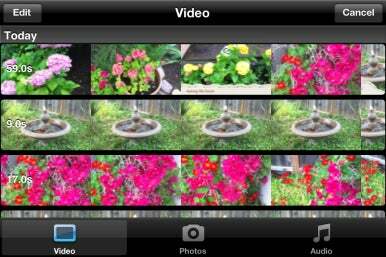 Prior to iMovie for iPhone, you had precious few Apple-supplied editing options for the video you captured with the iPhone. After shooting video you could open your clip in the Photos app, trim its front and back, and sync it back to your Mac or share it via e-mail, MMS, or to a MobileMe gallery or YouTube. These options still exist within the Photos app, but iMovie additionally allows you to piece together multiple clips, place transitions between those clips, add titles, incorporate stills with the Ken Burns pan-and-scan effect applied to them, add a music bed that attempts to get out of the way when there’s audio in video clips, and apply a theme to the finished product. 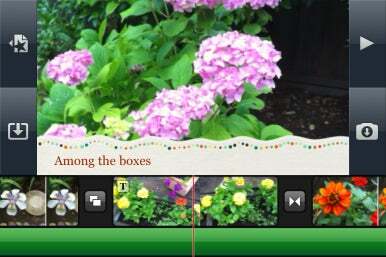 I’ve gone into detail about how this is done in my hands-on with iMovie for iPhone. Rather than repeat those details, I’ll sum up the way it works. iMovie for iPhone is compatible only with the iPhone 4. You can't use it with earlier iPhones, the iPod touch, or the iPad. iMovie's interface is made up of a preview area that takes up around 80 percent of the iPhone’s screen when in landscape orientation. Below the preview area is a timeline with a non-moving playhead in the middle of that timeline. Rather than moving the playhead to select a different portion of the video, you move the timeline itself—dragging back and forth anywhere on the screen to move the timeline. Anything under the playhead appears in the preview area. When you launch iMovie for the first time, you're asked to create a new project based on one of five themes—Modern, Bright, Travel, Playful, and News. You see evidence of these themes in the finished movie only if you apply a title, choose a theme’s optional transition effect, or add a theme’s canned music to the project. Do none of these things and you have a movie with no discernible theme that places cross-dissolve transitions between clips. Into this project you can add video clips that you’ve shot with the iPhone (but not videos in the iPhone’s iPod library), still images from the phone’s Camera Roll and photo library, and unprotected music tracks you’ve synced to the iPhone or tracks included with the five themes. Choosing video clips to add to a project. Regrettably, theme music tracks are only a minute long and you can't have more than one music clip in a project. If you assemble a longer project, you'll want to use music from your iPod library instead. However, you can't use music that was sold in protected form from the iTunes Store. DRM-protected tracks can't be added to projects. iMovie offers two volume settings for background music. While playing a still image or a video clip with no audio track (because you've removed it by double-tapping a clip and toggling off the audio track option), iMovie plays background music at the louder setting. For video clips that include an audio track, background music is played at a lower volume. Even at this lower volume, however, I found cases where the background music track over-powered the voice of someone speaking in a video clip. Adding clips, stills, and audio is as simple as tapping a Video, Photos, or Audio button and then tapping the item you want to add. In an instant, the item appears in the timeline. You can stretch clips and stills in the timeline so that you can more easily select a specific spot in the clip while editing. You can also add live video by tapping a Camera button and recording video from either the iPhone’s front or back camera. 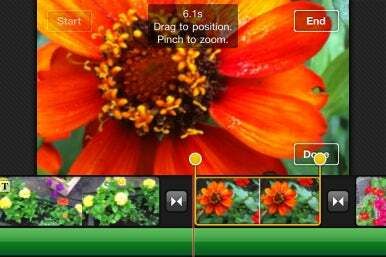 Do this and you see an interface very much like the Camera app where you can shoot your video. When you add a still image to your movie, iMovie automatically applies the Ken Burns pan-and-scan effect. To change the length of the still (stills are 3 seconds by default) just tap on the still and drag an orange handle to lengthen or shorten it. Configuring the Ken Burns effect is simple enough—set the position and zoom level of the start of the still by dragging and pinching, tap a Start button, and then set the position and zoom level of the end of the still. Tap Done, and iMovie pans smoothly across the still from the start to end position. Those, like me, who wish to use this effect only sparingly will be frustrated to learn that you can’t turn it off. You can, however, work around it by ensuring that the start and end frames are exactly the same. Applying the Ken Burns effect. You can trim the beginning and end of a clip by tapping on it in the timeline and dragging handles. You can’t, however, split clips. Thankfully, trimming is non-destructive. You can return to your project at any time and drag these handles to restore your trimmed footage. To rearrange the order of clips, just tap and hold on a clip and drag it to a new position in the timeline. To delete clips, drag them to the preview area. Adding titles is as simple as double-tapping on a clip and, from the Clip Settings sheet that appears, entering the title text in a text field, and choosing the title style you want—opening, middle, or ending. You can’t add titles to stills, however, nor can you adjust the length of titles within a clip—titles last through almost the entire length of a clip. To avoid displaying seemingly endless titles you'll want to be sure that any clips you apply titles to are short. Additionally you can't change a title’s font or font size. You can also choose to add a location to your movie via a Location command in the Clip Settings sheet. This can be a location based on your present position as determined by the iPhone, the geotag information embedded in a clip, or a location you enter in a Location field. A clip with a Middle title style applied. When your project is complete, just tap the Project button to return to the Projects page, tap an Export button, and export your movie using one of three settings—Medium – 360p, Large – 540p, or HD – 720p. Each setting produces an H.264 movie at 30fps at the respective sizes of 640x360, 960x540, and 1280x720. When you export a movie it’s saved to the iPhone’s Camera Roll, where you can share it via the means I outlined earlier. Note, however, that when you upload a 720p video to YouTube or your MobileMe gallery, it's compressed before uploading so that it doesn't appear in HD when published to the Web. To upload the full 720p version of the movie you must import the movie to your Mac and upload it from your computer. In terms of operation, it feels like iMovie was meant for the iOS. Where the lack of a formal timeline and the need for a fair amount of drag-and-drop in iMovie ’09 can be confounding on a computer, it makes sense on a touchscreen device. Selecting clips and stills and dragging them around with your finger is a natural way to piece together a video. This natural way of working is iMovie’s strength. The fact that you can work quickly may compel some to edit and share their movies rather than dumping them into iPhoto and forgetting about them. For those who desire something more polished than the raw clips produced by the Camera app but haven’t the patience for editing video on their computer, iMovie for iPhone could be a good fit. With footage in hand, just about anyone should be able to assemble a polished “What I did on my summer vacation” movie in 5 minutes or less. If, however, you’re looking for an iMovie ’09 equivalent for your iPhone, this app isn’t it. As I’ve pointed out, there are a lot of things you can’t do with it—split clips, adjust the length of titles, use different fonts and font size for titles, choose from a variety of transitions, crop clips, have more than one music track in a project, or apply effects. If you’re accustomed to performing such tasks with the movies you shoot, you should stick with your Mac’s video editor when quick-yet-slick won’t do. Or you could look at Nexvio’s $4 ReelDirector app, which provides many of these features. More feature-rich though ReelDirector may be, it isn’t a miracle worker. I find its interface more complicated, it can’t record video directly from the iPhone’s camera, and its output isn’t as clean as iMovie’s. It’s tempting to say “Look, it’s five measly bucks, just buy it. If you make one decent video with it, you’ve gotten your money’s worth.” But value isn’t entirely the point. The question is whether iMovie’s ease of use and natural workflow will tempt more people to shoot video with their iPhones and turn that video into something worth watching. Even with iMovie's limitations, I believe it will.